1. RAID YOUR GRANDMA’S HOLIDAY CLOSET. See what your family members have stowed away in their holiday closet that you could use for your own decorating purposes. 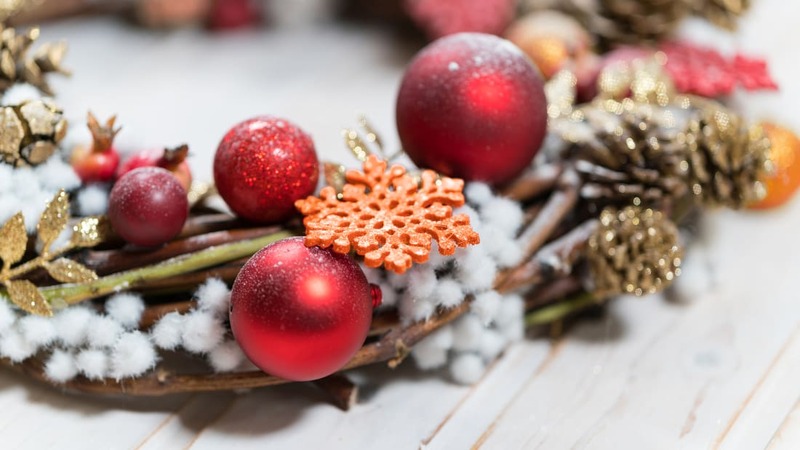 You might find some kitschy, fun objects from a holiday past that would look sparkly and festive displayed on your mantel or nestled on a side table. It also might be fun to display old family photos taken during the holidays around your place. If a family member has an abundance of holiday decorations in their garage (we all know someone like this), politely ask if you can borrow a few items from their collection. Not only will you be saving money, but you won’t have to worry about finding a space in your pad to store that reindeer lawn ornament after the holidays. 2. CHECK OUT THRIFT STORES. You’d be surprised at what holiday decorations can be found at a nearby second-hand shop. For instance, thrift stores can have great vintage glassware and bakeware for a fraction of what they cost new. While not necessarily holiday-oriented, they can add a bit of cheer when filled with treats or a cluster of pine cones in your living room. Plus, you can use that fancy glass bowl for other occasions throughout the new year. Vintage cookie tins can be another amazing find at thrift shops. You can use these simply as decorations or to place tasty goodies in during the holidays. If you don’t want to deal with a bunch of cookie tins later on, turn them into gifts. Besides being a budget killer, holiday decorations can also be a space hog. To minimize how much real estate they’ll take up in your abode in the off-season, you might want to skip the reindeer. Instead, look for items you can repurpose and use year-round. For instance, place a festive candle, shiny ball ornaments, or a string of copper lights in a jar. After the holidays are over and done with, you can reuse the jar to hold treats or as a perennial candle holder. And giant socks, adorned with a bit of tinsel or shiny ornaments, could be used as stockings. After the holidays, you can use these to store odds and ends. These are just a few ways you can go all-out and decorate your place on a budget. As you can see, getting into the holiday spirit doesn’t have to put a huge dent in your pocketbook. Being resourceful and creative will go a long way. 4. TAP INTO NATURE’S RESOURCES. A well-placed fresh sprig of pine or bundle of twigs found outdoors could go a long way with home holiday decor. If you’ve got a crafty side, try creating a DIY wreath or centerpiece made of pine cones, sprigs of Douglas fir, and shiny ornaments. All you need is some copper wire and a glue gun to get to work. You can also create an eye-catching centerpiece with a cylindrical vase, a votive candle, and some ornaments. If you’ll be traveling over the holidays, you can deconstruct your creations to use for wrapping gifts, or just stick the ornaments back on your tree. 5. GET CREATIVE WITH BOXES AND BOWS. Have a bunch of boxes lying around? Give them a bit of festive flair with some holiday wrapping paper and a big bow. You can place them on your front doorstep, lawn, or right next to the door to bring some holiday cheer to your home. There are also a ton of cool things you can do with some bows and ribbon. For instance, you can line the borders of an old wooden frame with some pretty ribbon. Or “wrap” your front door with large, red ribbon and a giant bow. 6. HUNT FOR MARKED DOWN ITEMS. Besides being on the lookout for killer deals, which start right after Halloween, sometimes holiday decor will be marked down because they were on display, or perhaps the box they came in was slightly damaged. Depending on the retailer, you may be able to score a bit of a discount on new items if you ask. While you’re getting your place fully decorated this year, you can add some holiday flair to your wallet for next year with extra cashback from your Discover card. Discover will automatically match all the cash back you've earned at the end of your first year as a cardmember. Terms apply. Learn more at Discover.com. Is Your Data Safe On the Go? How Much Do You Know About Black Friday Shopping?